In Montreal and hungry? This wonderful city just happens to be the location with the largest number of restaurants per capita in North America (this equates to a figure of over 65 per square kilometre since you ask!). It also provides some of the greatest variety on the continent with ingenuity being a main ingredient. The city has developed a daring style that deftly mixes invention with tradition for an inspired blend of local influence and world flavours alongside its obvious European heritage. The city is full of restaurants of every style and there is a smorgasbord of food festivals and markets around the seasons. The news is less good if you are staying downtown as many of these inventive spots are scattered around places like Old Montreal or suburbs like The Plateau and Mont Royal. Around the city centre is the usual proliferation of run of the mill chains, grill houses, fast food joints and take-aways, but there are however some great spots to be unearthed. 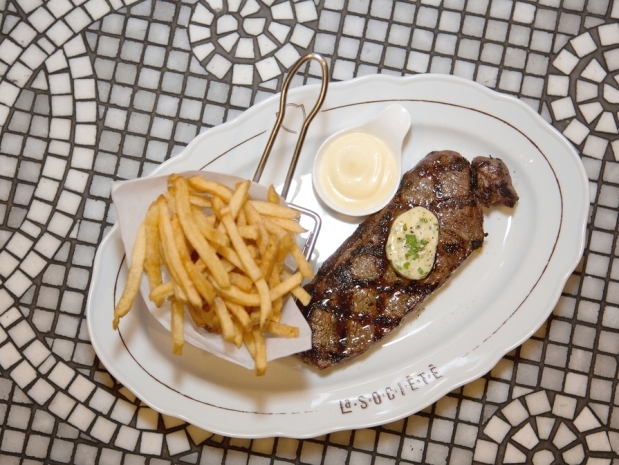 Amongst these is one of our favourites, La Société bistro. 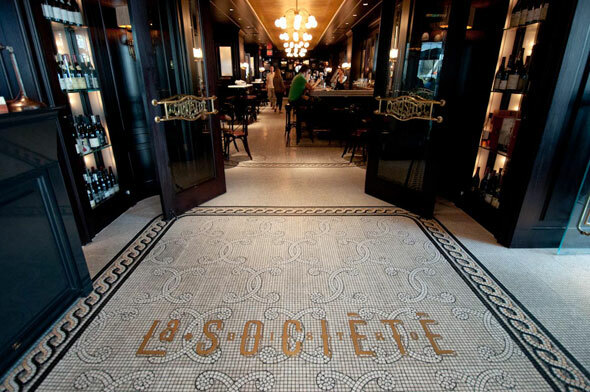 Strangely for a French-Canadian city, there is a distinct lack of this style of dining and this is is an omission that La Société has done much to right. Here is a truly authentic Parisian Bistro with dark mahogany woods, bentwood chairs, maroon leather banquettes and brass fittings. Prints fill up all available wall space whilst a colourful art nouveau-style skylight dominates the dining room. As part of the fine Loews Hotel Vogue (reviewed by CELLOPHANELAND* here) the restaurant is located either directly from the street or via the hotel lobby and a gilt mosaic entrance. It is a perfect spot for a French (or American/Canadian!) style breakfast and in the summer you can plonk yourself on the small street side terrace and watch the world go by over an excellent latte or two. Their eggs Benedict is spot on, served in a skillet with breakfast potatoes as is a light and fluffy, omelette – with either one herbs or mushroom. The weekend brunch, so we hear, also comes highly recommended. The dinner menu comes suitably endowed with all the traditional French bistro favourites. To start a rich soupe a l’oignon came with a nice and crisp floating slice of toasted french bread and lots of browned gruyere cheese and a generous slice of tasty tomato tart was topped with rocket and grated parmesan. Another option was a salmon fume with shallots, chives, creme fraiche and capers – apparently smoked in house. We skipped the usual favourites of oyster and seafood plates, moules frites, steak frites, sole meuniere and magnet de canard – all of which were on the menu – and opted for two of the fish options. A halibut pave was pan fried with brussel sprouts and mussels and a pan seared salmon was accompanied by leeks and olive sauce vierge. Both were richly flavoured and cooked to perfection, served on vintage china for an added historic charm. For desert the tarte tatin was rather rubbery and un-caramelised but a ball of rich home made ice cream and a perfect tiramisu, washed down by a couple of good espressos more than made up. This delightful meal was augmented by its authentic setting – beautifully and discretely lit I should add – along with prompt, attentive and cheerful service. We shall look forward to a leisurely lunch on the terrace when the temperature climbs above minus ten! Images by CELLOPHANELAND* and Loews Hotel.